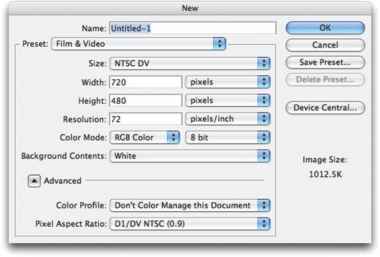 The Magic Wand tool selects pixels similar in color to the pixel on which you click with the tool. Like the other selection commands, you can add to, subtract from, or intersect with an existing selection, and you can select antialiasing. In Figure 8-9, you can see three additional options, unique among the selection tools. 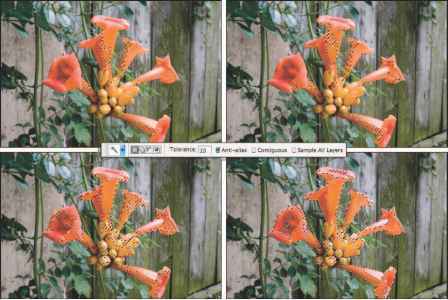 Tolerance determines how closely pixels must match your target color to be included in the selection. When you enable the Contiguous check box, only pixels connected to the spot that you click by pixels of the same color are selected. The Sample All Layers option lets you make a selection of similarly colored pixels on every visible layer in your image, not just the currently active layer. In Figure 8-9, you can see the result of clicking the same spot, using four different Tolerance settings. In the upper left, the Magic Wand was set to Tolerance: 10; in the upper right, Tolerance: 20; in the lower left, Tolerance: 50; and in the lower right, Tolerance: 100. You can see that the higher the tolerance, the wider range of color selected. When you use a low Tolerance setting, you select only those pixels in the image that are very similar to the pixel on which you click. A high Tolerance setting gives you a much wider range of color, which might or might not be appropriate for the selection you're making. Use a reasonably low Tolerance setting and Shift-click with the Magic Wand in different places to select a range of colors. In the photo in Figure 8-9, I would use a low Tolerance setting when Shift-clicking the highlights in the blooms to avoid selecting the highlights on the leaves and the fence. Figure 8-9: The lower the Tolerance, the fewer pixels in the selection.